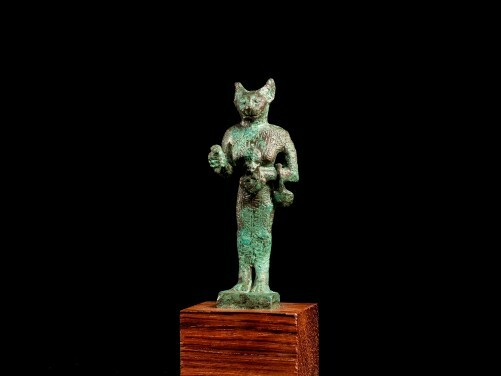 The cat-headed goddess depicted standing on an integral plinth, wearing a tightly-fitted patterned sheath, holding a fragmented sistrum in her right hand and the aegis of lion-headed Sekhmet in her left at her chest, with a round basket hanging from her left elbow. 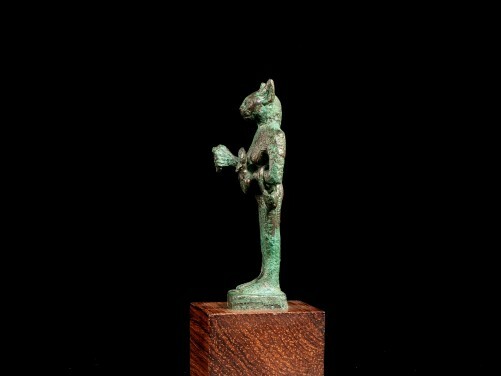 The iconographical representation of Bastet presented here is known as the "Housewife Bastet," and was popular during the Late and Ptolemaic periods in Egyptian art. This example is particularly rare for having all three attributes. Formerly in the collection of the late Paul-Henri Lapointe (1924-1998), renowned architect and prize winner from the Order of Architects in the category History. Mr. Lapointe published several books and articles, and presented many lectures on the subject. 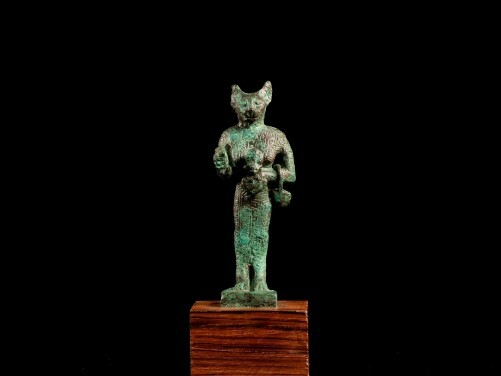 Acquired through travels in Egypt and the Mediterranean, 1960-1970s. The sistrum, once held at the right hand, is broken at the handle, surface remains uncleaned with green oxidation throughout, otherwise a complete example. 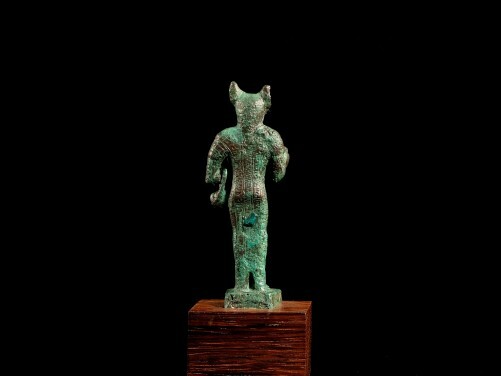 Malek, J.; The Cat in Ancient Egypt, pp. 104-6.